Put it in your purse or your pocket for easy access—essential oil roll-on is convenient and easy to apply—for on-the-go, wherever you go. You can roll the essential oil right on your skin. Vitality Extracts Roll-on Essential Oils are carefully diluted with coconut oil. Carrier oils such as coconut oil, olive oil, and grapeseed oil have their own therapeutic properties and are used to dilute the essential oils before applying to your skin and help carry the essential oils into your skin. It’s a good idea to do a patch test first to make sure there’s no reaction. The inner forearm is a good place to test. Some essential oils are more potent than others and that’s why testing is a good idea. Experiment to see what works best for you. There’s been great success with topical roll-on oils for headaches and skin conditions. The wrist is a very popular area to apply your roll-on. Not only is it therapeutic on your skin, it’s easy to lift your wrist to your nose to inhale the essence, doubling the benefits. 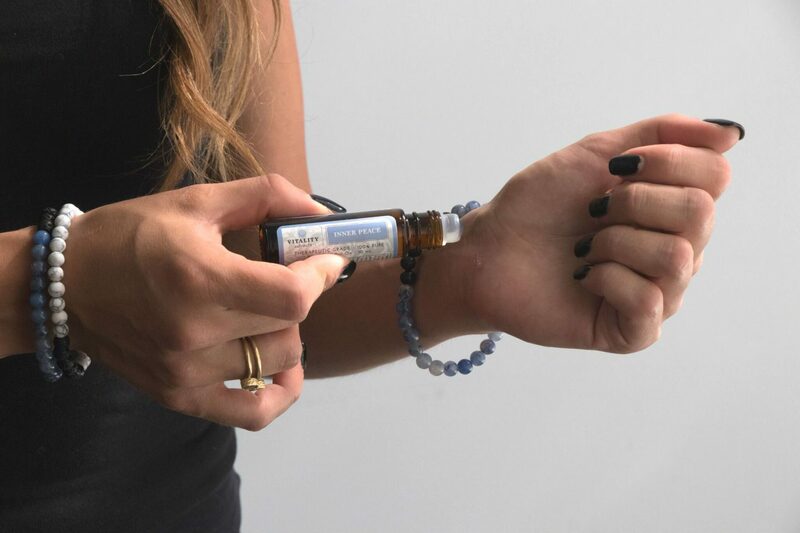 In addition to the wrist, pulse points such as the neck, behind the knee, or near the ankle joint are good places to roll on your essential oils. The feet are an ideal area to roll on essential oils for a few different reasons. The soles of the feet are less sensitive, so if you’ve done a patch test that resulted in irritation, you could test in on your feet. The pores in your feet are larger than the rest of the body, so the oils absorb more quickly and efficiently. There’s also the idea of reflexology, where areas of the foot correspond to organs in your body. With that in mind, applying Vitality Extracts Essential Oils to your feet could benefit certain parts of your body, as well. You can also roll essential oils onto your bracelet or necklace. We have a wide assortment of popular styles. Of course, to enjoy the aromatherapy of your roll-on—simply open the container and take a whiff. Age spots and wrinkles—our Vitality Extracts oils can be applied directly on your face. Try Lavender or Tea Tree. Headache—apply Immunity or Deep Muscle roll-on to your temples. Sore muscles—roll on our Deep Muscle Essential Oil Blend anywhere you’re feeling muscle soreness. It’s one of the most invigorating and enjoyable natural ways to manage everyday aches and pains, headaches — and even serious, chronic pain. A good night’s sleep—apply a few drops of Lavender to the bottom of your feet. Stress—try Stress Ease on your temples, the bottom of your feet, or the base of your neck. I’m loving my essential oils! I’m a freelance writer and I’ve been working with a client for about a month supplying different articles I’ve researched and written about essential oils. I’ve learned so much and have quite the collection. I use many of your oils and blends. Love them as they work so well..oils and roll-ons. I can not imagine not using them. Thank you for such a variety of product and these very helpful and informative articles. If you’re experiencing health problems, it could be a sign that a specific chakra is blocked.